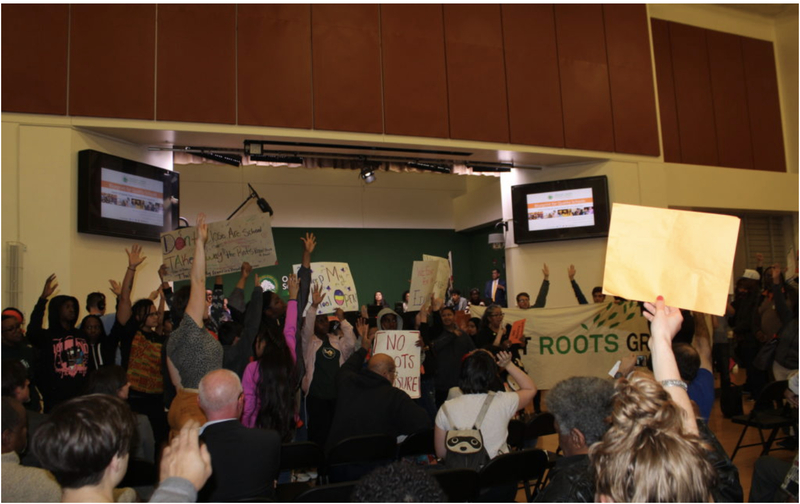 Despite passionate appeals from teary-eyed and fiery-voiced middle school students, teachers and parents, the Oakland school board voted Monday to close the first of up to 24 schools in the next five years. The move made the Oakland teachers union more determined to make school closures part of their tense contract bargaining that could end up in a strike next month. Keith Brown, union president, said after the vote that the union was inspired by teachers in Los Angeles, who asked to bargain issues not normally included in negotiations. 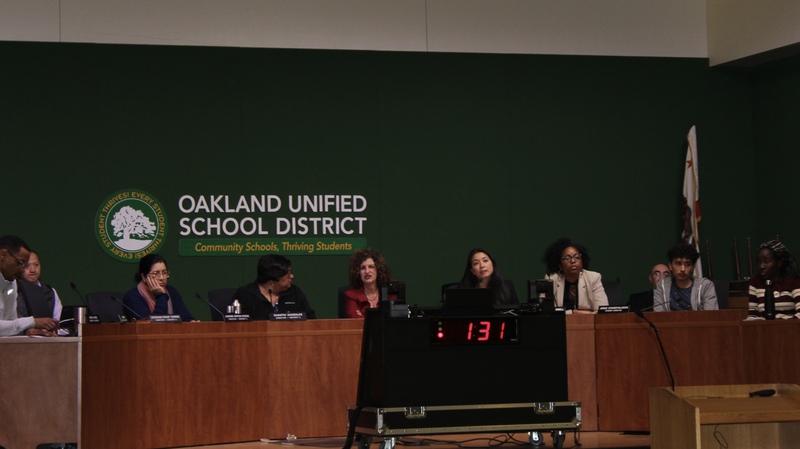 Oakland teachers say the district made school closures a bargainable issue by linking its plan to close schools to its ability to meet teachers’ salary demands. The elected officials voted 6-1 to close Roots International Academy in June, with board member Roseann Torres dissenting. Two student board members, who are not publicly elected, also voted against the closure. More than 80 speakers pleaded with the school board for more than four hours to keep the middle school open. The school is located in East Oakland and serves mostly low-income African-American and Latino students in grades 6-8. The vote also included the expansion of the Coliseum College Preparatory Academy, known as CCPA, which serves students in grades 6-12 on the same campus. However, that campus will only expand its 6th grade class next year, then will expand grades 7 through 12 in subsequent years. 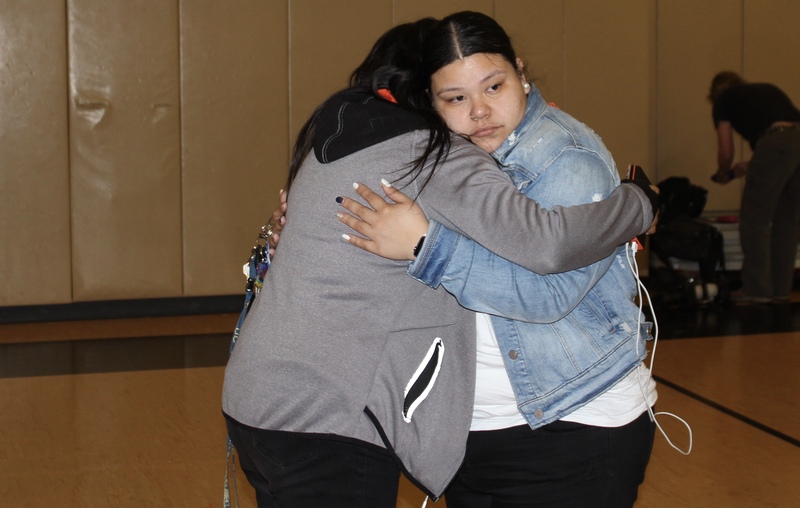 This means the school won’t be able to accommodate most of the more than 160 current 6th and 7th grade students at Roots, who will be forced to attend other schools that are farther away. Superintendent Kyla Johnson-Trammell and the school board members who voted for the closure said the decision was necessary to “right-size the district,” which has too many schools for the number of students it is currently educating. The district’s enrollment of about 37,000 is expected to continue to drop by 2023. The district identified school closings or consolidating to meet requirements of a state bailout to help cover its deficit over the next three years. As part of the deal, the district must come up with a long-term plan to stay fiscally solvent. Johnson-Trammell plans to bring a list of more schools to close or consolidate to the board next month, saying that the money saved on operating so many campuses can be “reinvested” in the remaining schools to improve their quality. The district is projecting that it will save nearly $5 million over the next four years through school closures, including $81,000 next year. A board vote expected Wednesday on $20.6 million in cuts for next year to avoid deficit-spending has been postponed until this week. The school closure vote came the night before teachers in the district began voting on a strike that could take place next month after a fact-finding panel concludes its work on Friday and issues a report based on facts presented by the district and teachers’ union. The union, which has been working without a contract since July 2017, is asking for a 12 percent raise over three years, smaller class sizes and more student support staff and resources. The district has offered 5 percent over three years, which would be paid for through some of the proposed budget cuts, district officials say. 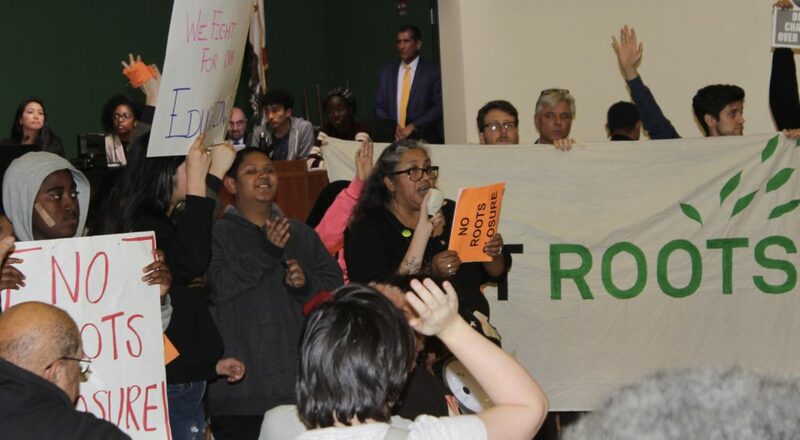 Parents and community members against school closures also threatened to boycott classes, file lawsuits, recall board members who voted for the closures and appeal to state legislators and state Superintendent of Public Instruction Tony Thurmond to intervene. The board left the room for nearly half-an-hour until the chants quieted down. Mike Hutchinson, a community activist organizing opposition to school closures, said an online petition to keep Roots open had gathered nearly 3,500 signatures and that his organization called OPEN, for Oakland’s Public Education Network, also plans to seek a legal injunction against the school closure because it will displace students. Hutchinson said he was gratified to see the level of public opposition to the Roots closure at the meeting. Although board members were sympathetic to the students and teachers at Roots, most said they agreed with Johnson-Trammell’s plan to reduce the number of schools in the district. However, they amended the motion to ensure that Roots students and their siblings will get priority enrollment at CCPA, above siblings of current students who attend CCPA. Board members also said they want to be updated on the progress of the displaced students as they move to other schools. Noting that many Roots students are African-American, board member Jumoke Hinton Hodge expressed concerns about how welcome the students would feel on their new campuses in various neighborhoods throughout the city. Acknowledging comments the board heard about the resilience, sense of community, and appreciation for art, music, poetry, restorative justice and student voice at Roots, Hinton Hodge said she wanted the district “to raise up and empower those things that are incredible about Roots so those students become ambassadors of the Roots way” at their new schools.